KNOWN ISSUE: Web Only Spins are Missing? Thanks for reporting, @martin091260. To check your account further, please reach out to our Support team. On my phone this morning, I show 4 web only bonus spins but when I log on with my computer NONE show up! Missed coins = now missing bonus spins? I have the exact same problem if they ever give you a resolution please post it Thanks. I have 2free games from friends on my iPad that say web only, they do not show up on my laptop why ? Appreciate your reports, Spinners. This has been reported to the team and they're currently working on a fix. For updates, feel free to visit the Hot Topics. You may also refer to this post and contact our Support team. 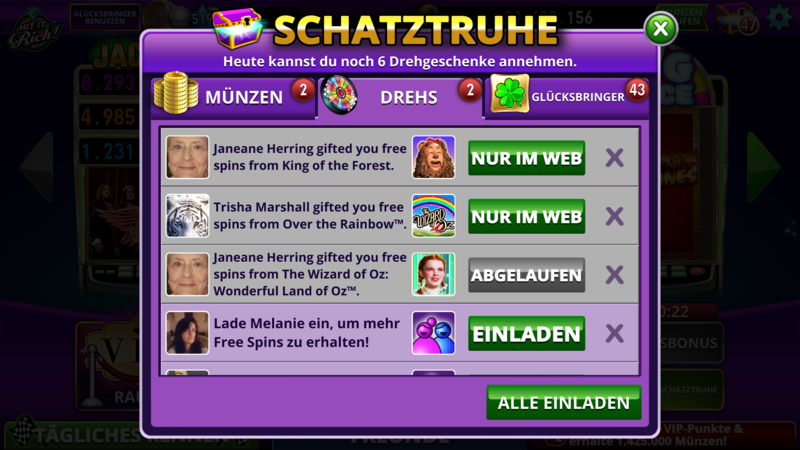 I know that a friend sent free spins, but they are not loading. I have had this repeated problem also. Wondering when HIR is going to fix this issue? Just want to enjoy my game play. This kind of makes me feel I am losing out considering I gift ALL my team players EVERY day. Come On HIR = let's get this right!!!! Thanks. My free spins are not loading, at one time I could refresh the game and get my lost coins. Now nothing there just lost. When I play Farmville II on Hit it Rich, and I get a bonus spin, I only receive half the coins that it says I win. Please fix. My friends have been sending me bonus spins, but I can't access them because they say web only. When I go to the web, the bonus spins are not there. Now they are all expiring before I even had a chance to use them. (They show up on my telephone) Please fix. Please fix the bug. Free spins for web only are displayed on mobile devices but not available on web site. I have 2 spins from friends that indicate Web Only but when I go online the spins are not there! Why have Web Only spins???? We should be able to play our spins on ANY DEVICE!!!! Reports of missing Free Spins has already been escalated to our studio team. We're still waiting for feedback on how soon this can be resolved. Hang in there. think of all the stuff we have not gotten since this has been going on for days and they keep blaming it on the flash player, not so, it is working everywhere else. I also have lost alot of coins when I click on them I loose them & it says that it's my flash player & I know it's not! Lost out on so many coins! I get free spins, but unable to get gifts or play any slots.